Survive. Cooperate. Open car doors. There are hundreds of games now that fall into the “survival game” genre, but in my opinion, very few pack the narrative “oomph” to push them into something engaging (I can only collect 10 sticks to build an axe so many times). This is where I think State of Decay 2 sets itself apart. It’s an extremely focused survival game with strong story-based elements that drive and guide you through the loop of gathering resources, building up your base, and surviving the zombie hordes. As the game starts you’ll pick a pair of survivors to play as. Your first task after going through the initial tutorial mission is to setup a base of operations. From there you’ll scavenge nearby houses, restaurants, stores, and other buildings for materials - Food, Weapons and Ammo, Building Supplies, and Medical supplies. Maintaining a consistent supply of these materials comprises much of the core gameplay loop as they keep your expanding community of survivors happy and healthy, and also allow you to upgrade sections of your base with specialized zones like a medical tent, garden, workshop, and more. Each of these zones utilize raw materials you find in the world to build critical components for survival. These items and upgrades like explosives, repair kits, bonus production stats, allow your group of survivors to grow. 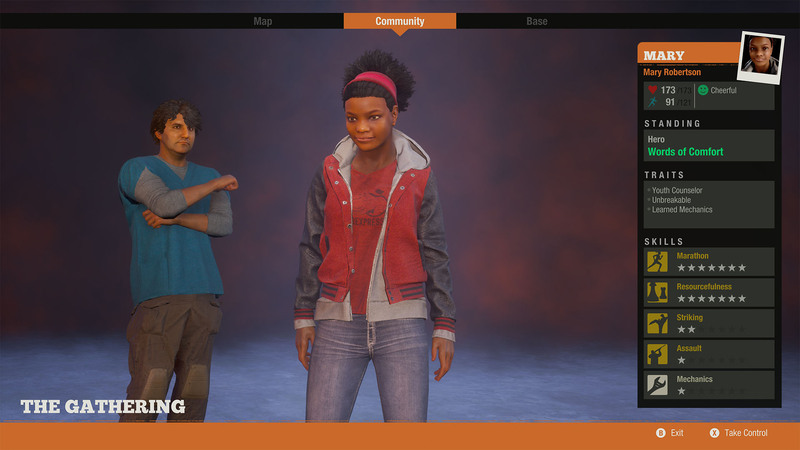 Outside of those core materials, the other important resource in State of Decay 2 is “influence,” which is earned from killing zombie hordes, clearing out infestations, helping other communities, and other survival actions. Influence is the currency used to trade, upgrade, and improve your characters. It’s also used to claim new buildings once you’ve cleared the zombies out of them. Establishing new outposts is one of the best things you can do with your influence as buildings will automatically produce some of those core materials over the course of a day. It also allows you to access your stash so you can drop off items you’ve gathered out in zombie-infested suburbia without having to travel all the way back to your main base of operations. The other major aspect to surviving in State of Decay 2 is building up a strong collective of survivors. Like a classic D&D role-playing game, survivors have relationships with each other, which can have a direct effect on the group as a whole. Someone having a bad day? Perhaps they’ll eat more food. Too bored? Perhaps they’ll waste ammo shooting at distant zombies. 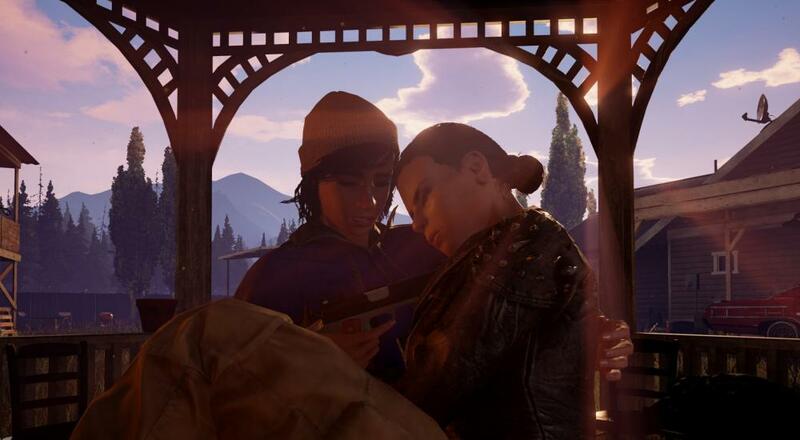 Survivors can even get in fights with one another if tensions rise, so you’ll need to keep them happy and keep an eye on their tendencies. Over time you’ll find more survivors out in the town, and if you’re in good standing (or they are in a really bad place), you can invite them to join your group. Eventually, though, you are going to run out of space and you’ll either need to expand by finding new outposts with beds and new homes for a base another base of operations, or exile someone from your community. In traditional Elder Scrolls-like fashion, you’ll level up survivor’s skills just by doing things more often. Sprint around the map? Your survivor will get better at cardio. Whack zombies often with a crowbar? Your physical endurance increases. Good at sniping headshots? Your firearms skill rises. Eventually you’ll be able to specialize these abilities with bonus traits to fully customize your survivor. This investment comes at a cost/risk, if they die, they are dead for good. All of your investment was just chewed up and spit out by that zombie horde. While everything discussed so far comprises the basic gameplay loop, there are constant curveballs and nuances of depth that affect your group’s morale and resources. Hordes of zombies will attack your compound. Rival groups of survivors will steal supplies. Along the way you’ll need to take down plague hearts - vile spawning stations that poison the air and really ramp up the zombie aggressiveness in an area. Clearing them gives you vital supplies to create a cure for the zombie plague. You’ll have to specialize which survivors learn new skills in order to upgrade specific sections of the base. Whatever the game throws at you, you manage it and then continue on your quest to eliminate all the zombies. The map is huge to explore and eventually you'll switch from being on foot to driving vehicles. State of Decay 2 adds the one big thing everyone wanted from the original: cooperative play. Co-op just feels natural in a game like this and with four player support you can really ramp up the strategy and execution of your plan to retake the map. 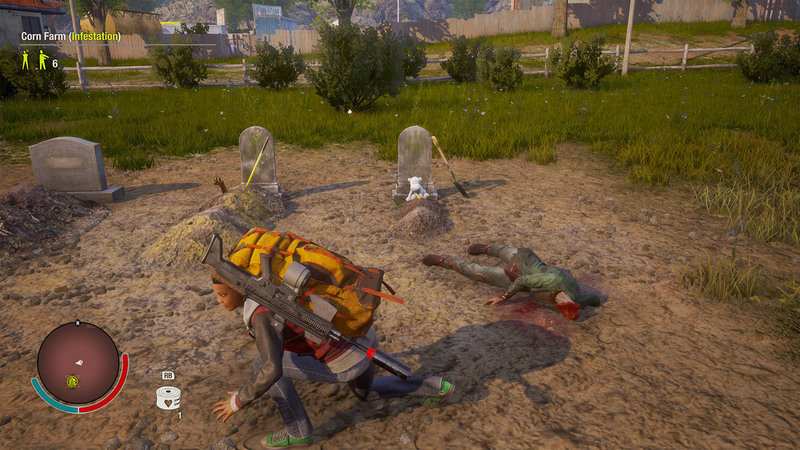 The way in which State of Decay 2 handles co-op is a bit unique, however. Anyone that joins your game brings in one of their survivors from their own community, which they can swap out for one of their other survivors at any time. However, they cannot use any of the host's survivors nor can they contribute core materials to their base, only to yours. Basically, while they can level up the attributes of that survivor and store consumable items, guns, and ammo in their stash to use in their own game, they cannot advance the "state" of their community. Fortunately, there are some added incentives for your co-op buddies to hop in and help. 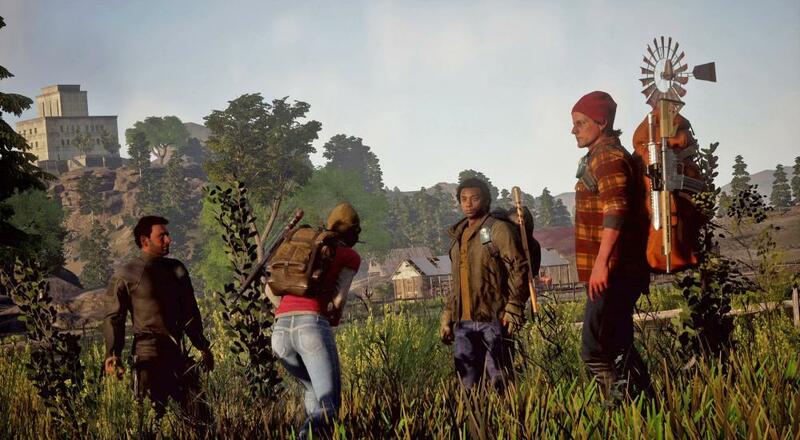 There's a kind of co-op reward system built into State of Decay 2 that provides co-op partners with rewards, such as rare weapons and consumable items, just for helping out and playing with a friend. The longer a co-op partner plays, the better loot they'll receive when they leave your game and go back to their own. It’s an interesting concept for a co-op game where you can’t advance your own story and progress, and frankly, I can get behind it because I know it’s not always possible to make that seamless. Speaking of seamless, the co-op is full drop-in and drop-out. When a player joins your game you are alerted to their presence and the game world changes slightly. The most notable thing is every building to be cleared now has distinct areas to search that are color coded to each players’ color. So potentially, clearing an area yields more goods. The addition of another player means you can carry back more rucksacks for supplies too. 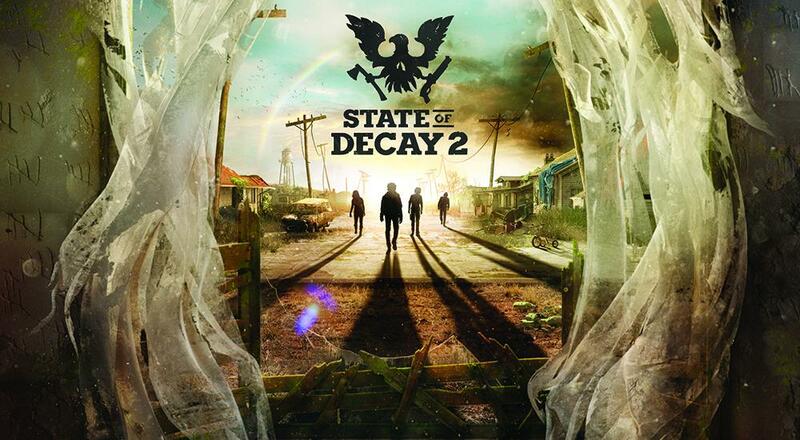 Speaking from the "co-op partner" point-of-view, and as someone that played a lot of the original State of Decay, I'll say that I agree with everything Nick has said thus far. I usually bounce off of "survival games" around the time they suddenly jump from chopping down trees with your handmade axe to having to construct a 12th century castle with working moat in order to successfully fend off whatever is coming after you. State of Decay 2 never feels bogged down with endlessly gathering and crafting. Going out to get supplies and materials for your community always comes with a little bit of a risk as you could wind up in a bad situation that leads to the permanent death of your survivor. On the other hand, you cannot sit in one spot and hope to maintain a status quo. There is always something that pushes you into having to make that journey and deal with whatever new crisis emerges. While it is a bummer that I was not able to progress my community by helping Nick, I didn't end our play sessions feeling empty-handed. The consumable items, ammo, and weapons that I collected and put in my stash were beneficial in my own game as they allowed my survivors to push further and gather more than I would have without any of that. That's even before I got the bonus rewards for just playing with him. I also earned "influence" while playing with Nick, which transferred over into my game, and that, too, was beneficial in helping me quickly establish outposts and upgrade some of my survivors. So, while there is not a direct 1:1 advancement for a co-op partner, there are still a lot of benefits. And hey, once you've helped your buddy for a while, they can always hop into your game and help you out! To me State of Decay 2 feels like a mixture of Grand Theft Auto, Dead Rising, and a Minecraft style survival game. It simply hits all the right notes and keeps players coming back for the slow steady progression and survival intricacies within its gameplay. Co-op shines, bringing out the fun factor, creating those had to be there moments like players opening car doors to hit zombies while cruising around town. There’s this constant carrot and the stick mechanic keeping you coming back for more. It helps that combat is satisfying, visuals are tight, and there’s plenty of story to keep you engaged. State of Decay 2 is one of those games you shouldn’t miss even if you are only mildly interested in zombie games. The Co-Op Experience: Invite friends to join your game, or drop into theirs. Work together as you explore the deadly post-apocalyptic environment, watching each other’s backs and sharing the rewards of your accomplishments. Each player maintains command of their own personal community and roster of characters. Page created in 0.2359 seconds.